There’s a long-standing view in research that the first years of a child’s formal education should be dedicated to basic reading skills. The teaching of subjects like history, mathematics, science, and literature can wait. Arguably, after all, if children haven’t learned to read something that should be accomplished by the time kids enter third grade, they’re not gonna be able to gain knowledge about other subjects by reading on their own. You can also like sample organizational analysis templates. To some extent, it does seem like a good idea to focus on reading skills in a child’s early years to develop knowledge and hopefully, reading habits on the side. But there’s a part of reading that involves decoding or being able to connect sounds with the letters representing them. Experts also say that whether or not readers understand a text largely depends on the amount of background information and vocabulary they have about the subject or topic. You may also read impact analysis. Comprehension skills it would seem is rendered secondary, and this might be because authors leave out a good amount of information, leaving the readers to fill in or understand, otherwise, their writing would turn into an impossibly difficult task. You can also like budget analysis templates. With education authorities in the government and policy makers preparing every two years for the release of what’s commonly known in the United States as the Nation’s Report Card, the National Assessment of Educational Progress, or NAEP contains the results of reading and math tests to sample students across the country which continue to reflect scores that have been stagnant over the past two decades especially for standardized reading tests. Uncle Sam, we have a problem. The serious lack of progress in reading scores have had policy wonks conducting more standardized tests that are reliable at the most but still doesn’t provide answers because there can be so many reasons why students perform poorly in reading. You may also see risk analysis templates. It would remain obvious that students from low-income family lack the skills of their more affluent peers because their parents have neither the time nor the resources to make them practice reading at home. But what of the rest? How do we improve the content of instructional materials to answer to the need for American children’s literacy? Teachers, for the most part, have the same questions and at the very least, have been doing what they can to correct or improve their students’ level of understanding (or lack thereof) a material. You can also read cash flow analysis templates. And what if there are students who have a problem reading letters correctly for deeper reasons such as dyslexia? Education experts, leaders, and teachers have used different methods for evaluating and improving reading and comprehension skills, but the most common and most effective tool would probably be a miscue analysis. You may also see business analysis templates. Although there’s no substantial data for guiding the reading process especially how oral reading miscues are interpreted, there are studies that could be used to serve the purpose of analyzing miscues. However, recent studies are also suggesting miscue patterns as being subjected to a variety of functions and among the many factors it includes are the instructional method, a background of the reader, skills and reading purpose as well as the content of the material. You can also read requirement analysis templates. 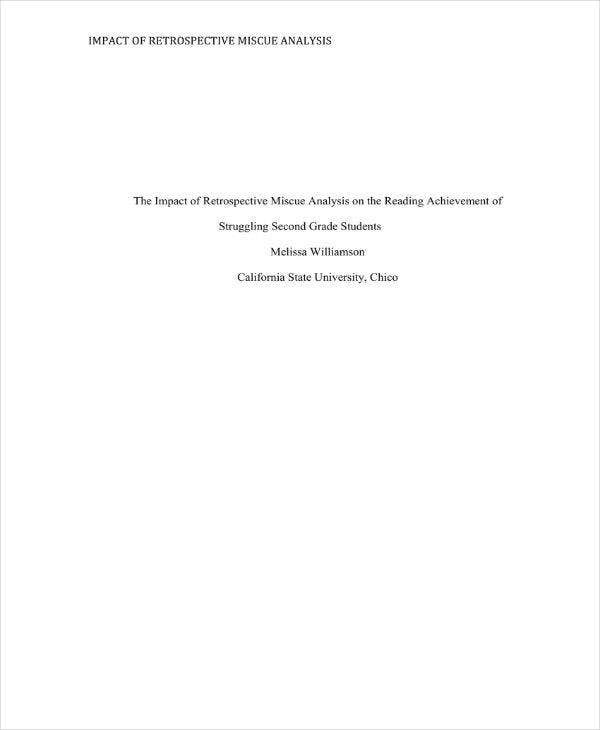 Ken Goodman originally developed the miscue analysis to gain further understanding of the reading process. 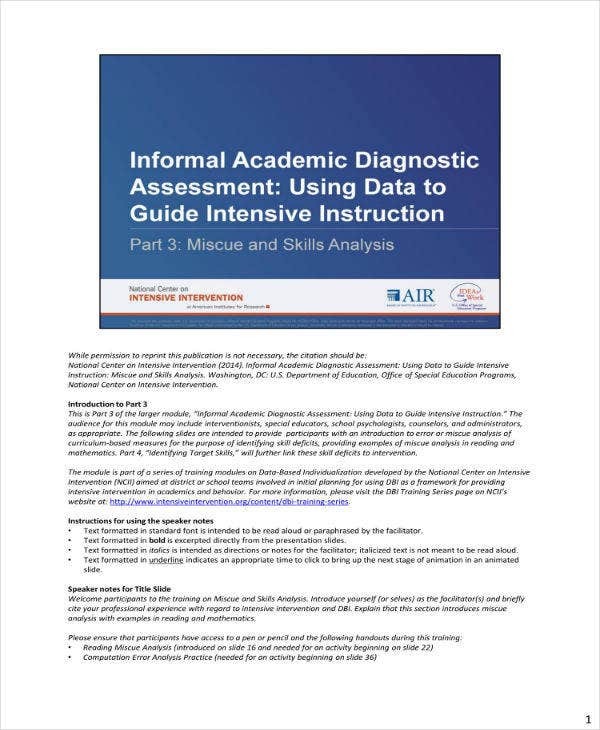 The analysis is a diagnostic tool that has been very helpful to both researchers and educators for them to gain a deeper insight into a child or student’s reading. A “miscue” is a term coined by Goodman to describe a mismatch of the actual response in reading and the expected responses. He makes use of the term “miscue” refusing to consider it an error or mistake to avoid implications of value. Goodman further says that the departure from the text isn’t necessarily a bad part of reading but rather “windows on the reading process.” You can also check financial analysis samples. According to Goodman, a miscue is defined as an observed response that does not match what the person listening to the reading expects to hear. You may also see business impact analysis templates. 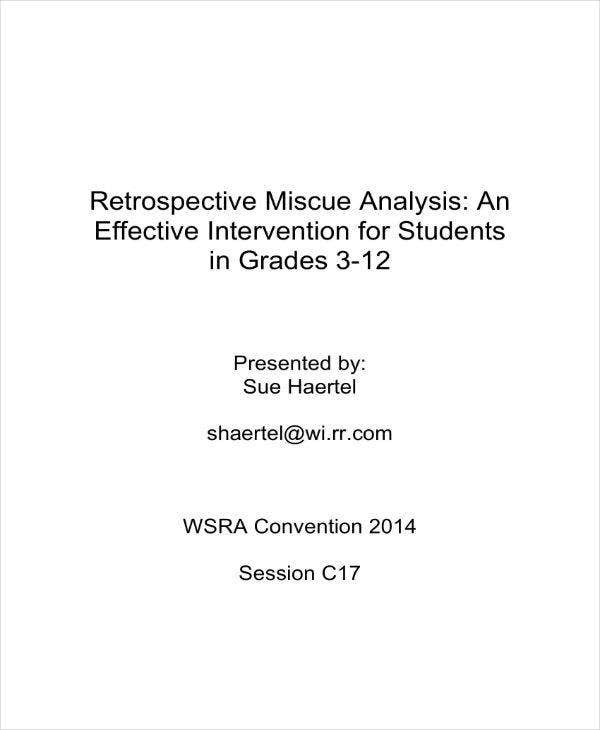 Procedures for a miscue analysis include the gathering and observation of a complete oral reading session preceded by a retelling. These procedures and standards for doing them are available in the books by Ken Goodman and co., the Goodman Taxonomy and the Reading Miscue Inventory. You may also read free analysis templates. 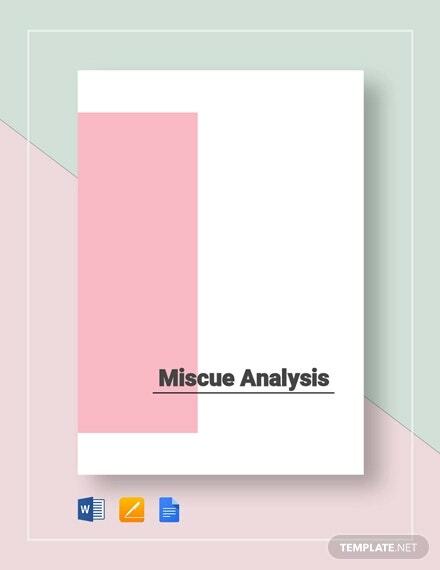 Miscue analysis is different from other laboratory-centered, standardized, or any other experimental diagnostic and quantitative or qualitative instruments in the sense that conducting a miscue research requires reading in as natural an environment as possible, with the participants reading original and complete stories orally, which they haven’t been exposed to before. 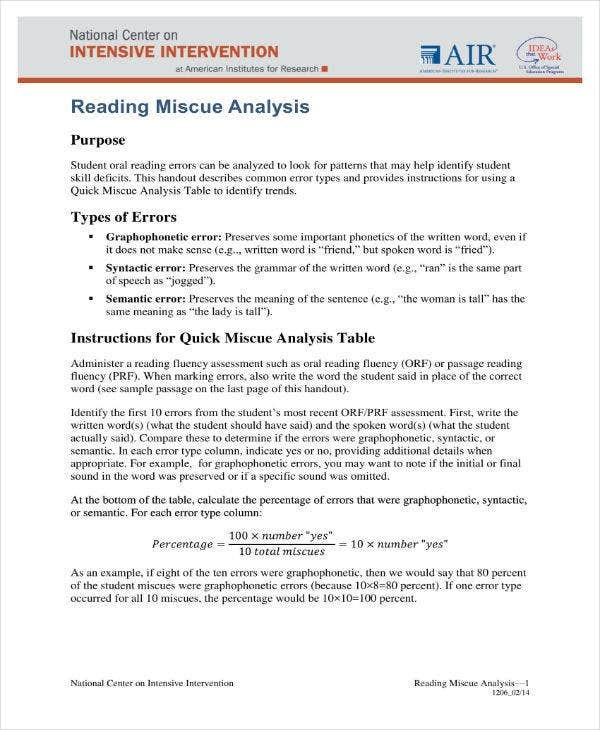 This way, miscue analysis offers a more natural and realistic point of view with the resulting analysis of reading proficiency being both qualitative and quantitative. You can also read printable analysis samples. The focus of the analysis should be on the unexpected or mismatched responses given by readers under evaluation. 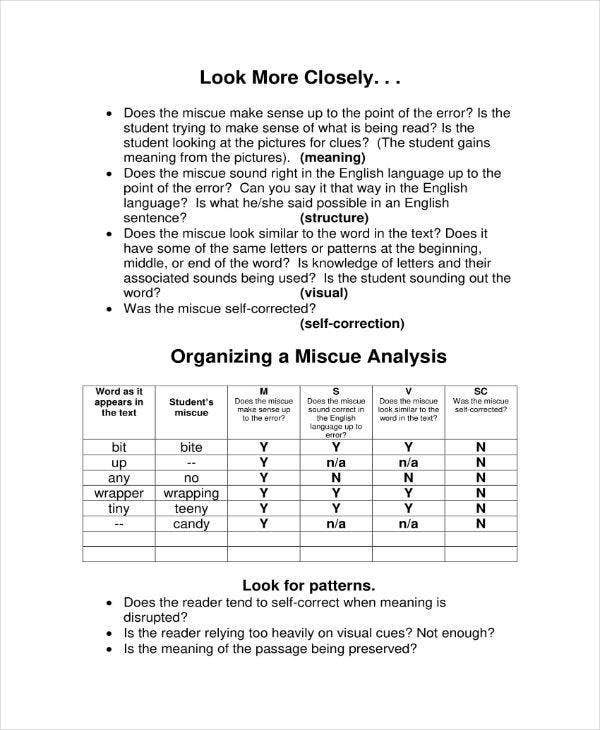 These aren’t counted as mistakes or errors but rather non-random indications of a student or individual’s reading skills, knowledge of a language, background knowledge, and reading techniques. The interest lies on the miscues and how such miscues change, improve, or disrupt the meaning of the text in a material. You can also see printable project analysis templates. The observation of a reader’s miscues offers ideas into the ways in which language cueing systems are integrated into the reading process in order to build or create meaning. The so-called real-time meaning creation is called “ongoing comprehending”. Issues with the construction of meaning can be noted in the collection and miscue analysis which may be helpful clues to a child’s wrong interpretations after reading. You can also see force field analysis templates. Conducting a miscue analysis may seem intimidating if it’s your first time. It can also be time-consuming but the amount of time you dedicate to evaluate a reader or a student is absolutely necessary. The more you do an observation however, the easier the process gets. In short, you’ll get the hang of it. You can also like case analysis templates. Use material or content that’s unfamiliar, not anything the child recalls from memory or has background information of. You may also see situation analysis templates. The analysis will be inaccurate and would lose its value when conducted with an emerging reader but the information you gain may still be useful later on. You may also see customer analysis templates. It’s important to provide the reader “under scrutiny” with a choice in the selection of a reading material. An environment is crucial to the analysis. You have to be in a quiet place, free from any interruptions and it would be better if you record the reading session so that you have something you can refer back to when you need to listen to a passage one more time for clarifications. You may also like sample needs analysis templates. Make a copy of the selection that the child have to read and use this in noting or documenting miscues. Document each miscue. Use hyphens for words that are skipped in the text, errors, substitutions, use for insertion and record the words; encircle omitted words or underline words that are repeated. You can use various signs for taking notes. You can also check out stakeholder analysis templates. A common sign of a skilled reader. A correction of an error is a miscue that the student corrects in order to better make sense of the text in the sentence. You may also see sample software gap analysis. A child sometimes adds a word that isn’t on the material and this is called “insertion”. In oral reading, the student removes or omits a word thereby changing the meaning of the sentence. This happens when a student reads a word or part of the text repeatedly. Instead of what’s in the material, a child substitutes a word that he could or couldn’t make sense out of, in a sentence or paragraph. You can also like marketing analysis templates. After identifying the miscues, the next step would be analyzing them. A miscue would be a very telling sign about a child’s reading process. For substitution, for instance, a child would sometimes substitute a word in frustration of failing to understand the word he is reading. You may also see cost analysis templates. Does the substitution make sense and can it be considered a logical substitution? If the meaning of the text doesn’t change regardless of substitution, most of the time, it is enough to just pay attention to the child’s reading accuracy. This means he or she may be reading from meaning which is, after all, the most important skill in reading. You may also see time impact analysis. 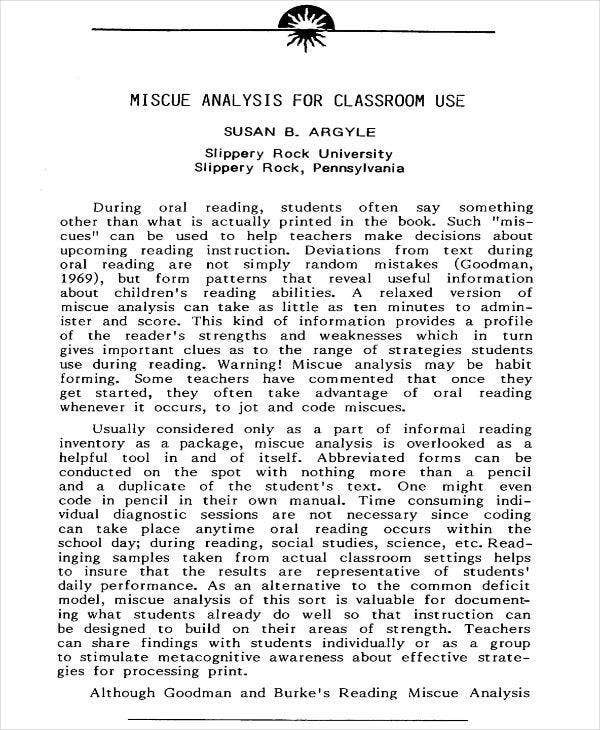 Currently, quite a number of studies exist on miscue analysis from different perspectives for the goal of exploring the reading process, assessing readers and improving content in reading materials as well as reading instruction. Although the focus of such studies differs from one another, generally, they confirm Goodman’s theory and model of viewing reading as a process of seeking meaning in which readers can make use of graphics, phonemic, syntactic and semantic cues or representations in making sense of texts. You can also like business gap analysis templates.